Rory: Hi, I’m Rory! How are you? Are you fine? I hope you’re fine. I’m fine. I love it when people are fine. Princess Eloise thinks I’m a little high-strung but I don’t think so. Do you think so? Princess Eloise: [Giving the little brown terrier a disdainful sniff.] You are high-strung. I guess that’s to be expected of a dog. You don’t conduct yourself with much dignity, you know. Rory: That’s okay, princess. You have enough dignity for both of us. You know who else has dignity? Amy. Amy’s our person, and she’s the best! She’s been going through a rough patch, though. That mean bossy boss of hers has been bossing her around and generally being mean to everybody! Amy told me she’s going to buy that place and make it the kind of café it ought to be—a really charming place where people will enjoy hanging out and eating all kinds of good food. I love food. Do you love food? My favorite is beef. No, chicken. No, turkey. No, beef. I don’t know. What’s your favorite? Princess Eloise: I know you weren’t addressing me, but I prefer salmon. I wonder if Amy will serve salmon at her new café. If she does, I won’t go there to eat it. Going places to get food is the type of thing peasants do. I prefer my food to be brought to me. And then I can decide whether I’m in the mood to eat it or not. But I do hope Amy gets her café. I’m more partial to her mother Jenna, but I care for Amy too. She’s a good human. Rory: You shouldn’t make it so obvious that you prefer Amy’s mom, princess. That hurts Amy’s feelings. Princess Eloise: What do you care? You’re the one always snuggling up to her. If I were to take a fancy to sitting on her lap, where would that leave you? Rory: Good point. I enjoy sitting on Amy’s lap, so things are okay just as they are. It probably doesn’t hurt Amy’s feelings that bad anyway. Keep having Amy’s mom as your favorite. Amy’s mom should be your favorite anyway, you know. She’s the one who raised you as a kitten. She can’t help that Aunt Bess is allergic to you and that you couldn’t go live with them. Princess Eloise: I’d appreciate it if you do not bring up that tiresome woman’s name to me. Rory: I don’t think Aunt Bess is tiresome. For an old human, she has lots of energy. And the stuff she puts on her computer makes Amy laugh. She does something called pinning to boards. Amy will sometimes laugh until tears stream down her face when she reads from the board Aunt Bess calls Lord, Have Mercy. Princess Eloise: Yes, I know good and well that Amy laughs at all that nonsense. She’s awakened me from many a pleasant nap with that unladylike chortle of hers. Rory: Ah, come on, princess. You love Amy. Deep down, I know you do. You act like you don’t particularly like any of us except Jenna, but we’re your family, and you love us. You know you love us. [Dancing around the white Persian.] Admit it! Admit you love us! Princess Eloise: Don’t push your luck. 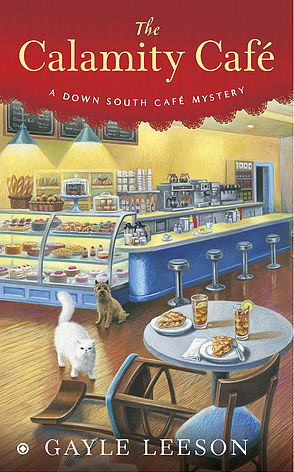 Gayle is giving away a signed paperback copy of The Calamity Café (to U.S. readers, international readers will receive a digital copy). To enter, leave a comment on this blog post with your name and email address (entries without email will be disqualified). Sounds like a great series. I'm looking forward to reading it. Love terriers. In fact my BFF is a Westie!! Would love to read more about Rory and his person. mlarkin at rmrgroup dot com. Great interview with Rory and Princess Eloise. This really makes me want to read the book. Sounds like a great read. Super cute! I have been eyeing this series - sounds like a great one! Thanks for the chance to win. This author is new to me. The book sounds good! Sounds fun! I like that interview! So fun! What a dignified princess! Thanks for the chance to win! The Calamity Cafe sounds great. Thank you for introducing me to Gayle Leeson's book. Thanks for the opportunity for the chance to win your book The Calamity Café. Oh yes please! I want this book! A fun post thank you. Please pick me!!! Would love to win, thanks for the chance. Fun listening to their viewpoint. Thanks for the giveaway. Thank you all for the wonderful comments! I'm so glad you enjoyed hearing from Rory and Princess Eloise. The random number generator has chosen Melissa--Biszemom@gmail.com--as our winner. Congratulations, Melissa! I'll be in touch ASAP to get your information. :) Everyone else, keep in mind that our cozy giveaway begins on Friday so you'll have a daily opportunity to win. Good luck, everyone!